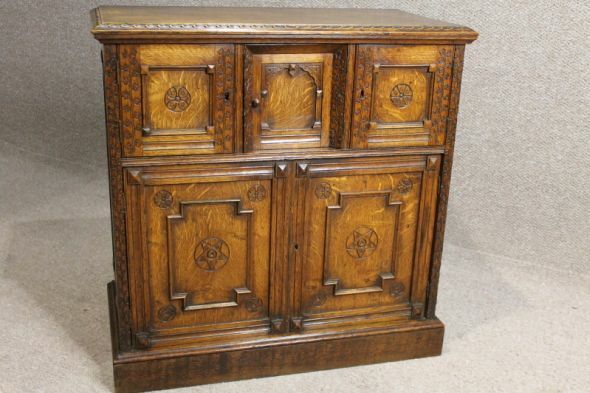 A beautiful late Victorian carved oak small cabinet. Featuring three small cupboard doors to top, a large pair of cupboard doors to base and a single fitted shelf. The cabinet is in excellent condition, and we believe that it dates from circa 1890. It is beautifully carved to the front, and panelled to the sides. With its attractive small size, it is ideal for a small cottage or house. Unfortunately, we do not have any keys for the doors, but this is still a wonderful piece of period furniture.